Select the Web Signup Forms Option from the Lists Menu. This will open the Form and Email Design Wizard. Next, select the Permission Reminder Form from the Resources Drop Down. After you have selected the Permission Reminder Form you can make changes to the behavior or design of your form through the Resource Settings section or the Design Settings section. Description—the form text that will appear above the text entry field. This should be helpful text explaining to users how to unsubscribe from the list. Link Text—the text for the link that will show at the bottom of the form. The design of the Permission Reminder form will be exactly the same as the Signup Form (which is the master form) until you make and save any specific changes. 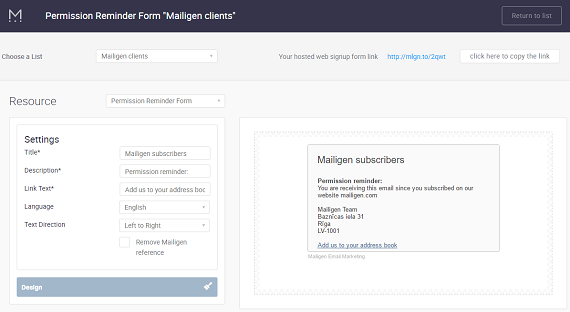 You can also add the permission reminder into an email campaign by selecting the appropriate merge tag.